Mercedes-Benz 123- and W212-series were manufactured by Daimler AG. These two types are in my view two of the most beautiful series ever built. My wife and I own a Mercedes 200 and a Mercedes 220 Bluetec, those seen in the picture above. The 123-series was built beween 1976 and 1985 even though the stationwagons carried on until January 1986. The 212-series was built between 2009 and 2016. Our Mercedes cars belong to the last of their model series respectively. 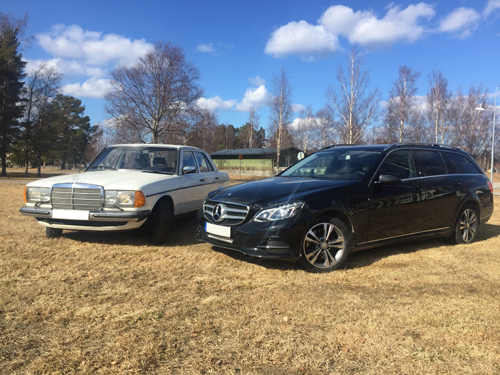 Our W123 was first used May 8, 1985 and our S212 December 29, 2016. The latter was, however, manufactured May 4, 2016 and Daimler discontinued production of the model series two days later on May 6, 2016. W in for example W123 stands for the German word Wagen, wagon or car in English. S stands for Stationwagon in for example S212. We had no idea of this when we bought our first Mercedes in 2013, but we learned about it when we joined the Swedish Mercedes-Benz Club some weeks later. Learn more about the model series at Wikipedia, 123 and 212. Most people in the know seem to use the W as a cover all for the various types in the whole series. My interest was aroused when my parents bought a Mercedes W115 in 1976, but as I was already three-four years old by the time, I realised that Daimler had released a new model series, the W123, even though I did not know that it had this designation. I found the new Mercedes to be more beautiful than our own car. The first time I ever rode in a W123 was probably when I did not dare to cross the road after a big truck had passed there a few minutes earlier. My parents' friend had a taxi and she brought me home free of charge. My mother asked about the price but the friend did not want any money for it. The first time I ever drove one myself was September 1, 2013. It was the red one seen in many pictures below. I did not know what to expect beforehand, but when I drove it I liked it so much that I bought it. In May 2016 I sold it to a man in Arvidsjaur. On July 23, 2016 we bought a white W123, but three days later we saw our present W123, which was also white. Three weeks later we sold the first white one, as the second one was in much better condition, even though we liked the first one, which had a sunroof. The Mercedes cars in the pictures are cars we have owned or own, but there are also other cars that we have seen in the street or somewhere else. Lizette and I have taken all pictures ourselves.